Volatility ruled the roost on Thursday as the benchmark NIFTY50 swung either side in a deeply volatile manner and finally ended the day with a gain of 59.15 points or 0.58%. The Markets have reinforced the credibility of the support of 50-DMA at Close levels and also that of 10180-10200 range support area. Before ending the benchmark Index recovered nearly 110-points from the lows of the day. Going into trade on Friday, we expect this pullback to continue. The Exit Poll’s outcome of the BJP retaining power in Gujarat will also set to sentimentally aid the session on Friday. In any case, the levels of 10330-10360 still require to be crucially monitored. The levels of 10310 and 10360 will act as immediate resistance area for the Markets. Supports come in at 10200 and 10135 zones. The Relative Strength Index – RSI on the Daily Chart is 50.9371 and it continues to remain neutral showing no divergences against the price. The Daily MACD stay bearish trading below its signal line but it is moving very sharply towards positive crossover. On the Candles, a long lower shadow emerged. It potentially marks a reversal of the trend. 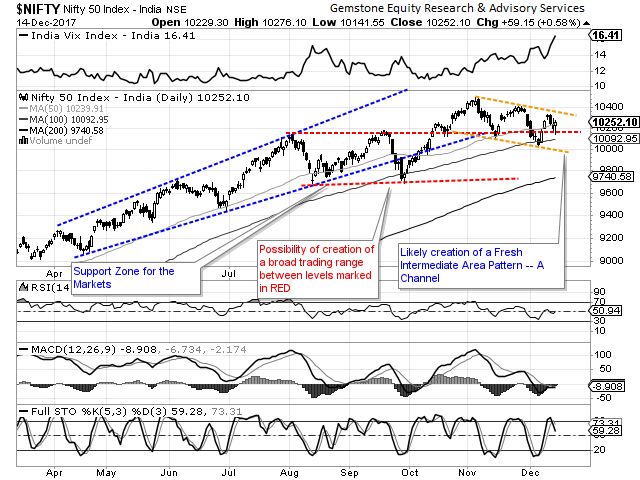 It remains significant as it has emerged near the support zone of 10180-10200 area. The pattern analysis shows that the NIFTY has reinforced the validity of the support area of 10180-10200 area. Despite minor breach, the Index recovered. It has also reinforced the validity of the support of 50-DMA levels at Close. While we face Friday’s trade, a positive opening aided by outcome of all Exit Polls which favor BJP retaining the power in Gujarat may not be ruled out. However, on the upper side the resistance still exit in the area of 10330-10360. 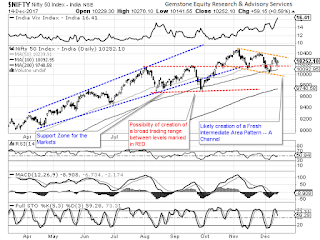 The NIFTY continues to trade in a falling channel which has emerged as an intermediate trend. We recommend making very select purchases. Cautiously positive outlook is advised for the day.